The October 2008 community technology preview's Windows Azure Tools for Visual Studio 2008 add-in provides pre-configured Web Cloud Service, Worker Cloud Service, Web and Worker Cloud Service, Web Role, Worker Role, and CloudWorkflow templates for Windows Azure Web applications and services. 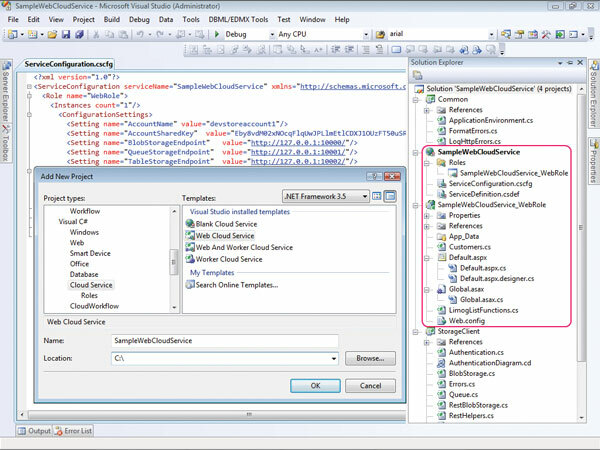 Creating a new Web Cloud Service adds a ProjectName service node with ServiceConfiguration.cscfg and ServiceDefinition.csdef files, and a pointer to a ProjectName_WebRole project, as shown for this article's SampleWebCloudService project in Solution Explorer. Common and StorageClient class libraries provide local logging features and wrapper classes for Azure Storage Services' REST API. The Limog class contains code to regenerate the CustomerTable.